Title of the work: Sinfonía mixta (2006-2008). Commission: French Ministry of Culture and GRAME (Lyon). World premiere: 15.03.2007, Biennale Musiques en Scene, Varese Concert Hall of the Conservatoire National Superieur de Musique of Lyon. Performers: Ensemble Orchetral Contemporain conducted by Daniel Kawka. Music informatics: Christophe Lebreton. Imposing composition, prize-winner of the GRAME, scheduled for Lyons. Sinfonía Mixta for ensemble and electro-acoustics is a new work by Javier Torres Maldonado due to be performed on March 15 in the Salle Varèse of the Conservatoire National de Musique et Danse in Lyons, as part of the series “Biennale Musiques en Scène 2008”. Commissioned by GRAME (Centre National de Création Musicale), the work has already won first prize at the VI Concours Internacional de Composition pour musiques mixtes of GRAME and the Ensemble Orchestral Contemporain. The work will be premiered by the Ensemble Orchestral Contemporain itself under Daniel Kawka. The composer introduces the work as follows: «Some aspects can already be deduced from the title: the first, superficial, obviously draws attention to my interest in the interaction and integration between acoustic instruments and electro-acoustic systems. However, the choice of the term “mixed” derives from more deeply within the roots and the structure of the project, which is characterized on the one hand by the wish to achieve a synthesis of ideas that have typified my work up till this moment (first and third movement), and on the other by the wish to integrate radically different elements of temporal and historical origin within a single formal unit (second movement). 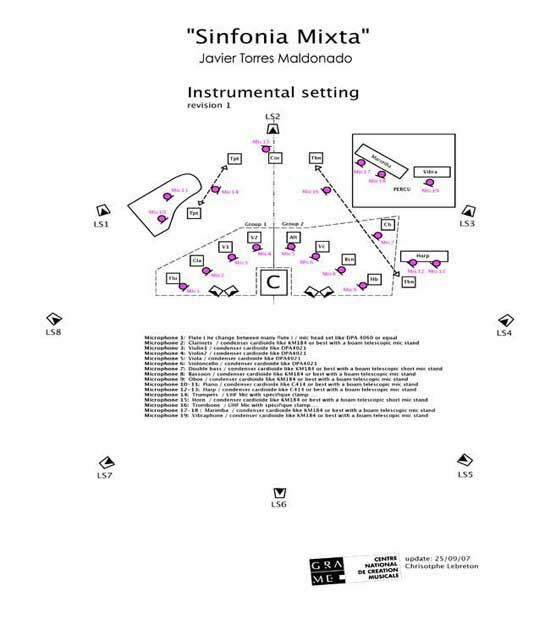 Instrumental setting of Sinfonia Mixta, diagram by Christoph Lebreton. The first movement is underpinned by three basic scraps of sound, whose extreme expansion determines the duration of the central section; the processes of contraction of these scraps, on the other hand, marks the temporal and spatial evolutions. Many of the electro-acoustic treatments respond to the dynamics of the instruments, particularly those of the trumpet and trombone. The tendency to intensify the electro-acoustic treatment towards the end of each of the three sections is actually associated with the contraction of some of the sound objects. Three melodic and rythmic contraction examples in Sinfonia Mixta. Finally, in the third movement, the main idea is the use of fragments of harmonic fields deriving from spectrums, each with a different fundamental and a semi-tone apart from the others; each of these fundamentals constantly slides within the space of a major second. This procedure so dear to me generates moments of absolute harmonic concordance but more often of extreme spectral distancing. The overlapping of sound objects built on the basis of harmonic fields of combinatorial origin, the dialogues in space between the instruments and electro-acoustics always deriving directional processes and the gradual descent, not regular in register, from the beginning to the end of the movement, complete the synthesis of techniques that I have experimented previously in other pieces, such as Exabrupto for 3 groups of instruments, a pianist and a percussionist, De ignoto cantu for ensemble and electro-acoustics, and various others. The central movement (dedicated to the memory of Berio and Maderna), concentrates more than the others on the essential meaning of the term “mixed”, something that is made up of elements of different origin. Berio had already experimented with this idea in his Sinfonia by using fragments of works by composers of the western tradition, while in the 1990s Donatoni composed a splendid reworking of Bach’s Arte della Fuga. But I could cite many more examples. Reflecting on the third movement of Berio’s Sinfonia, I had long thought of the opening as a gateway pointing to the future; so on the basis of this idea I decided to take up the first movement of Mahler’s fourth symphony as the backbone to the second movement of Sinfonía Mixta, with significant differences compared to Berio’s work, above all that of not limiting myself to the models of composers who worked during the first half of the 20th century; so I decided to broaden the historical perspective towards two Italian composers who were pioneers in electro-acoustic music, namely Berio and Maderna, by including quotations from electronic pieces by both composers. Other important differences include the quotation of not only large orchestral compositions but also chamber works, as well as the most obvious aspect of all: the sonic means employed. The three movements make use of contrasting sonorities, but certain elements from the first movement reappear in the second and third, while other material used in the third movement is actually anticipated in the first. The golden section is used as the basis for the whole structure of the work, but is reorganized in a kaleidoscopic fashion, in what you might call labyrinth-like moments». 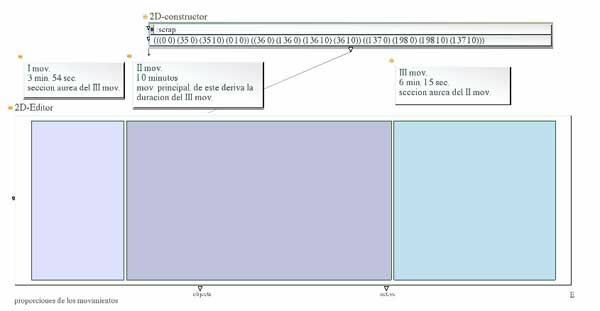 General time-duration proportions of the three movements of SInfonia Mixta. ©Edizioni Suvini Zerboni, 2008, Milan, ESZ News Magazine No. 43, 01.2007.